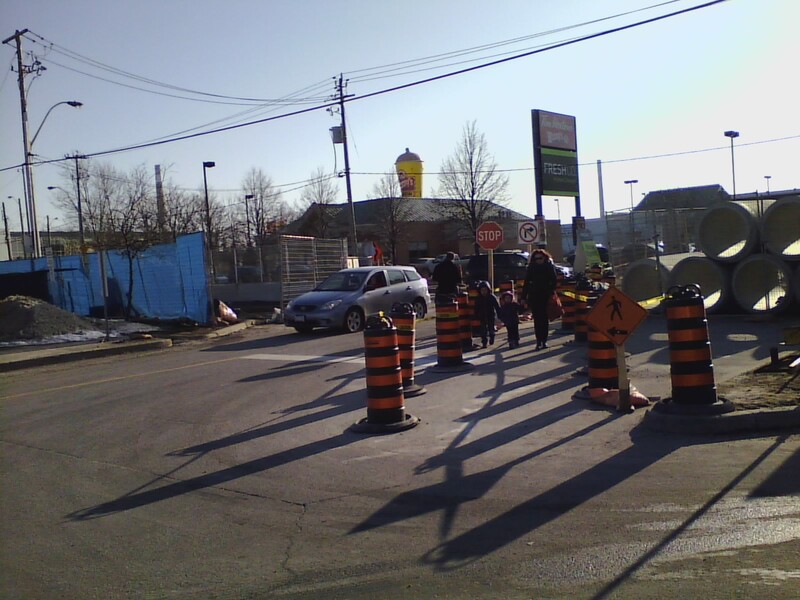 @Ward30Bikes ‘Pre-Walk’ of the @TTCLeslieBarns Public Liaison Committee’s – March "Safety Walk"
The Leslie Street reconstruction configuration has changed. The @TTCLeslieBarns Public Liason Committee is walking the new traffic re-routing as concerns cyclist and pedestrian detours from Queen Street down to Commissioners Avenue tomorrow night (2014-03-19). 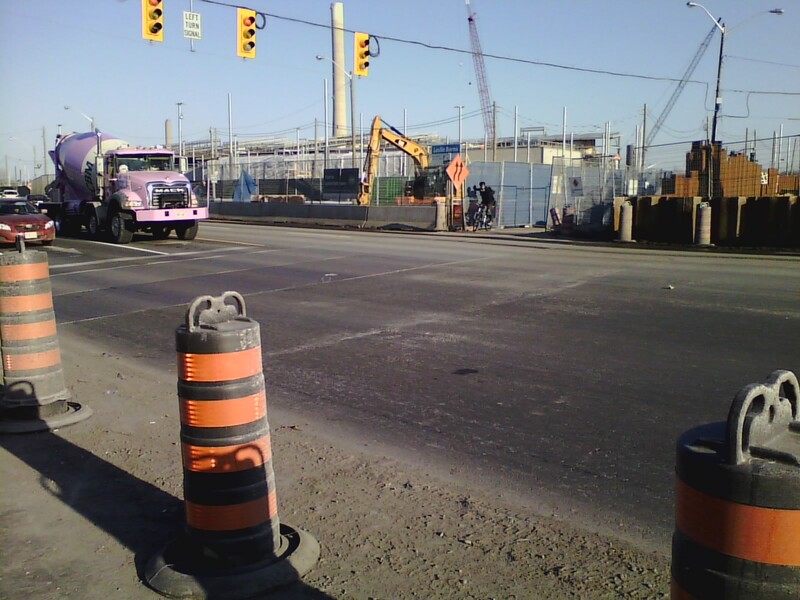 To see it in day light – and to linger to see how drivers and pedestrians and cyclists are actually negotiating the new configuration – I walk the site in the day – as I have done four other times earlier in this project. As I noted in video here before (http://ward30bikes.blogspot.ca/2014/02/ttc-leslie-barns-street-reconstruction_14.html) – and at the last meeting of the Public Liaison Committee at South Riverdale Community Health Centre – the East side Multi-use crossing across Lake Shore Blvd is extremely dangerous – especially for northbound cyclists and pedestrians. 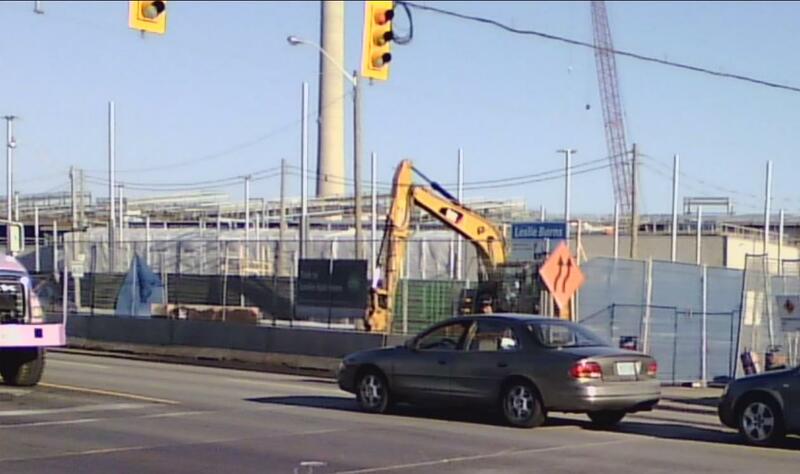 As I explained before – when the construction moved to the South side of Lake Shore Blvd. on the East side of Leslie Street (from Lake Shore down to Commissioners) – it shifted the northbound Leslie right-turn lane 22 metres to the west from the Cyclist/Pedestrian crossing. No signs were added by City of Toronto Transportation to the roadway, even though the crossing is sitting out in no-man’s land. As far as it is from the actual intersection – it is now like an unsigned, mid-block crosswalk on an arterial roadway – except this one is 5 lanes wide and much faster. Here’s a couple of images I took just as I arrived at the corner today at about 5pm. A cyclists is waiting at the northbound crossing detour from the Martin Goodman Trail to the Lower Don Recreation Trail. I snapped his picture – and then exactly what I’ve been talking about – happened. By the time I looked up from putting my camera back to capture mode – the first car onto eastbound Lake Shore from northbound Leslie had already driven right through the cyclist’s attempt to use the crossing – as I raised my camera to click a shot, the second driver in line turning onto Lake Shore from Leslie had stopped in the crosswalk blocking the egress of the cyclist. The cyclist had to get off his pedals and re-orient his bike so he could get around the nose of the car, that was completely blocking the bicycle/pedestrian crossing. The driver was obviously surprised to see the cyclist there, and had stopped as soon as possible. Looking south east from the Wendy’s Corner at Leslie and Lake Shore – a cyclist waiting northbound, east side of Leslie at Lake Shore Blvd. 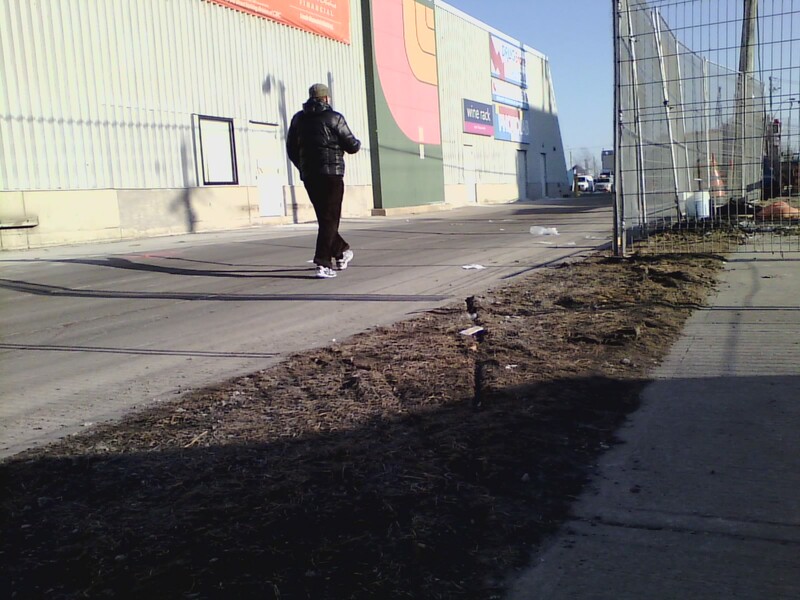 A few minutes later I walked across the crossing southbound – and meet there at the doorway in the fencing, a woman who was walking her dog – we got talking about how dangerous it felt – and how dangerous it Was. “You really have to be careful here!” she said. So the crossing sign turns white-walking-man and we begin out into the hail of speed – I’m pointing like we used to do at those arterial crosswalks with the overhead big, yellow and black flashing crosswalk signs – we’re walking slowly, on our toes – tentatively out there – to see if they see us. I’m pointing, she’s pointing – the dog is a Rottweiler/Doberman cross – but he’s pointing too! The first car doesn’t stop; doesn’t even slow – he really didn’t see us. The next one does – finally – after slowing and then suddenly realizing it’s a Crosswalk, stops short. I saw this kind of thing 3 times in 1/2 an hour here – watch the video (I narrate 4 times but the guy in the yellow jacket has no conflict as no one was turning on that signal cycle at the moment he crossed) – the guy with the two dogs had to stop; the woman and I had to stop; and the original above – the cyclist in the pictures – had to stop. At the last Construction Liaison Committee meeting Martin Maguire from Transportation indicated – it seemed to me – that Transportation would look into giving the crosswalk a 6 second head start ahead of the green light northbound Leslie — and Pomerleau said they’d see about taking down all the stuff in the way of pedestrians line of sight looking westbound as you proceed North out of the construction fencing, ‘doorway’. Someone said they should do one at a time. I retorted that I thought we should do both at once. As per my request, the 6 second head start for cyclists doesn’t seem to have even made it into Transportation’s ‘Action Items’ list (only note about Leslie/LS: Nov 2013 signal length change – page 2/4 – http://www.ttc.ca/PDF/Transit_expansion_PDFs/LeslieBarns_City_Transportation_Update_Mar6_2014.pdf). PEDESTRIANS AND CYCLISTS NEED A HEAD START! I’m afraid – as the volume of Trail users grows with the weather turning warmer and warmer; and the evening light significantly longer all of a sudden – that the probability that someone is going to get hit at this spot is arcing up to 1:1 really fast. Cyclist volumes on the Trail have doubled since January. I saw three walkers off the Trail in the 20 minutes that I was there today. Zero in January when I was there for 3/4’s of an hour. 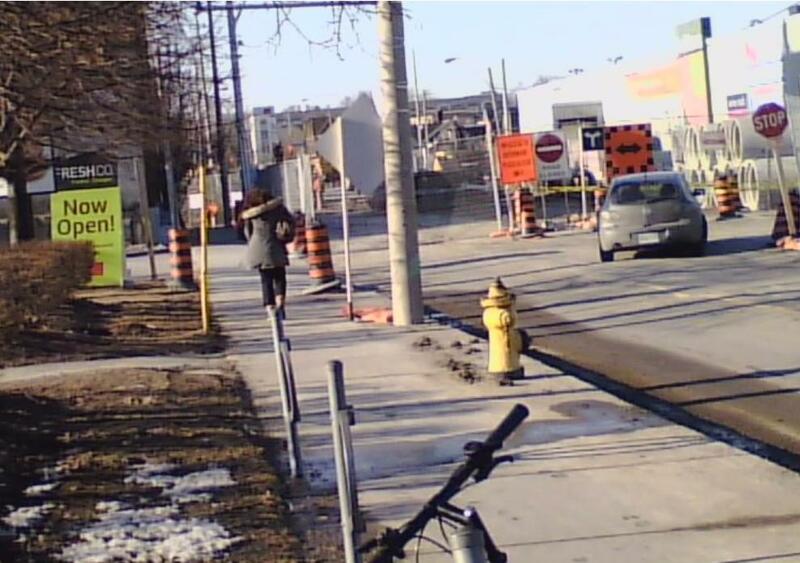 I took a couple of videos of the pedestrian/cyclist ‘shooting gallery’. Some less bad news for pedestrians; the East-side sidewalk from Eastern Avenue southbound, is still a sidewalk to nowhere. 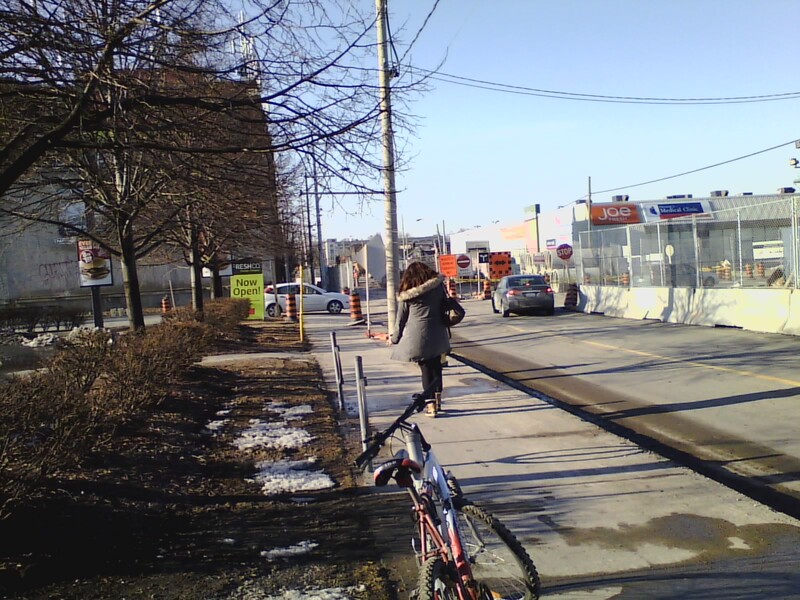 Cyclists and Pedestrians (by the tracks in the mud) are using the one-way southbound driveway in order to walk South. The Plaza Entrances Intersection now has a separated pedestrian crossing! .. unfortunately, it’s not all that intuitively placed – or something. I watched people use this intersection for about 1/2 an hour. Coming from the North down the West-side sidewalk; or across the North edge of the FreshCo Parking Lot – the crossing does appear to work. The entrance way into it, and it’s position in the landscape is understood by those approaching it. 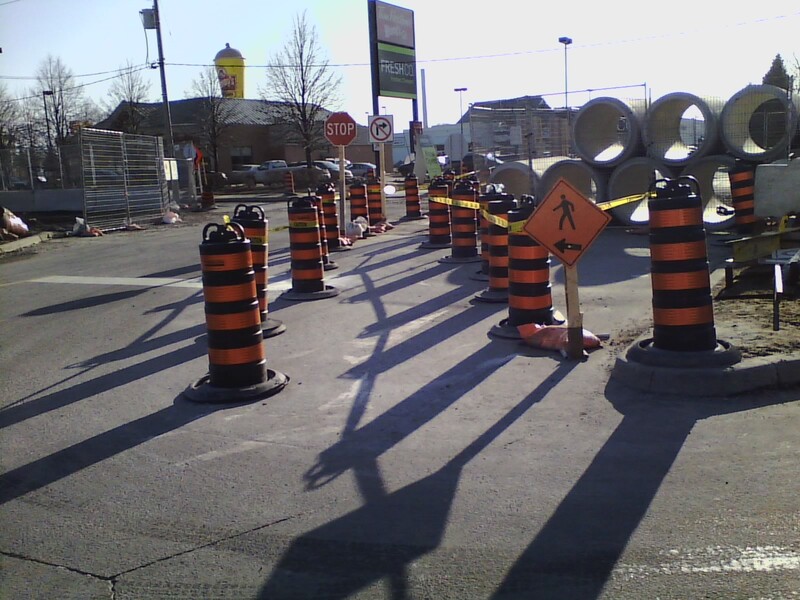 But from the East, from the main island at the Loblaws Grand Entrance for example – or from the parking lot to the Southeast, or south up from Burger King, or a hike on the Lower Don Recreation Trail – all you see is a jumble of road cones. Your mind doesn’t see a Pedestrian Crossing. I think the smaller, thin cones would work better along the line separating traffic and people. That might better high-light that it is a Pedestrian Way. Perfect capture of what I saw. Every time someone approached from the East they didn’t see the crosswalk. 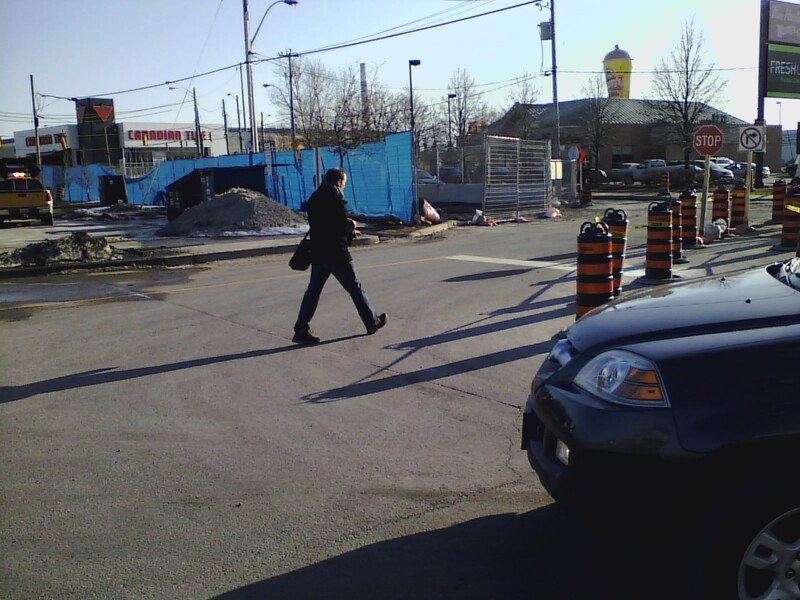 A man walking westbound in the car lanes, doesn’t see the pedestrian crossing. A woman and two kids coming from the East, they find their way intuitively. Next I walked across the pedestrian-way and took up a viewing station on the West side. Immediately I saw people walking across on the South side of the Plaza Intersection. As I watched for about 5 minutes, and after a number of people did the exact same thing – I realized that all those coming from the South along the West-side sidewalk – and those coming across the parking lot from the Southwest – were walking into the intersection from the Southwest corner and across the South side of the intersection. 2. The same woman walking towards the intersection a couple of seconds later… . 3. 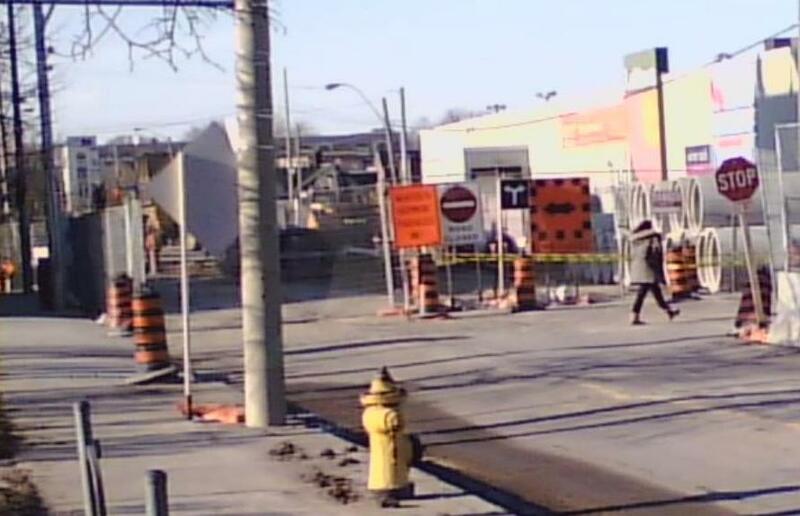 You can just see her behind the sign stepping into the Plaza Intersection from the South-West corner curb area (where the crosswalk normally is when Leslie Street is open). 4. 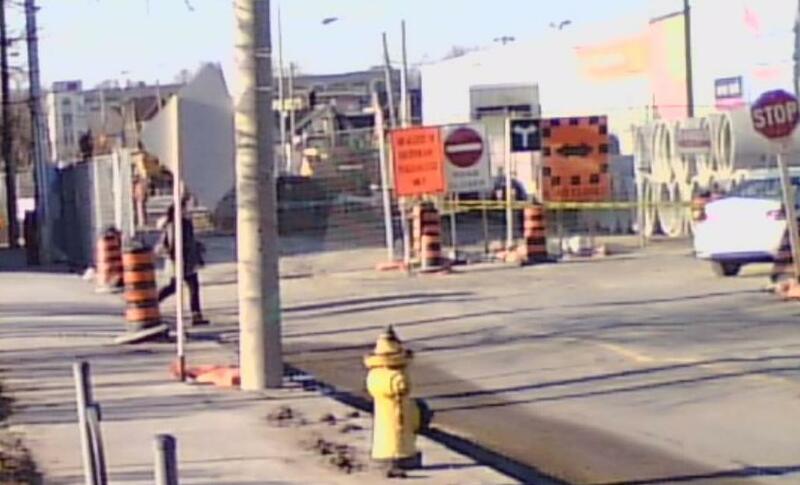 Now you can see she’s walking diagonally across the intersection towards the North-East curb and the sidewalks that lead to the Grand Entrance into Loblaws (or the one-way southbound driveway that doubles as a sidewalk on the West side of the store). I didn’t mark it on ‘Image 5’ – but where the purple line meets the sand bags on the right, you can see that the fence just happens to be on the same line. It helps inadvertantly, to indicate that this is where one is supposed to walk! Perhaps Pomerleau can square it up a bit; that will also slow cars down around the turn there – which is a good thing. But I think the ultimate solution is to run the cones along the edge of the West-side sidewalk, all the way to the point where cars and trucks out of the FreshCo Plaza make their turn southbound. The cones should be connected with yellow tape (like the crosswalk); and a sign added: “Pedestrians use North-side Pedestrian Crossing” … with a map of the intersection perhaps, and a big “Cross Here!” pointer arrow. That’s it for the Pedestrian gauntlet at the Plaza Entrances. 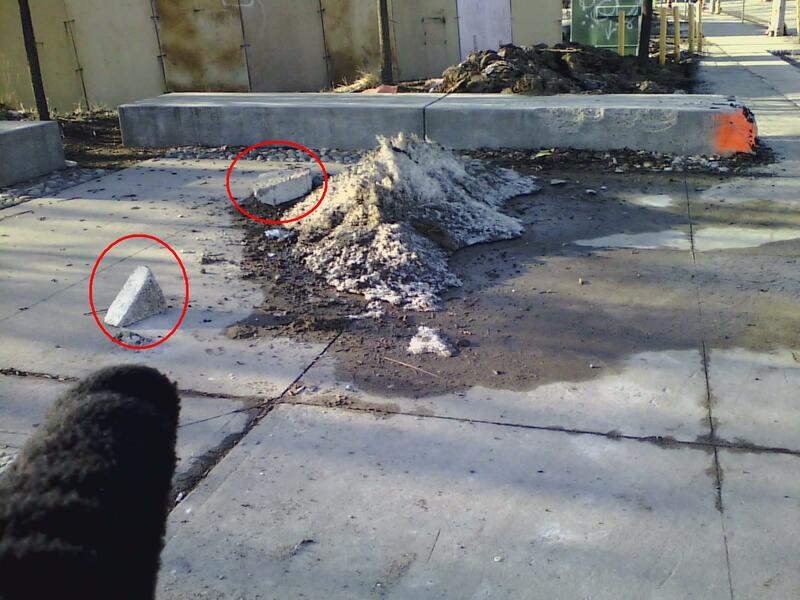 Here’s some concrete cut-offs that were left in a snowbank by accident one snowy day. Now as the snow recedes, they’re a trip hazard. Northwest corner of Leslie and Lake Shore. Walking it with the Committee again tonight (Wednesday, March 19th 2014). Next Post "I advocate for "Liveable Cities" Re-development; therefore I advocate for GREAT Bicycle Parking." 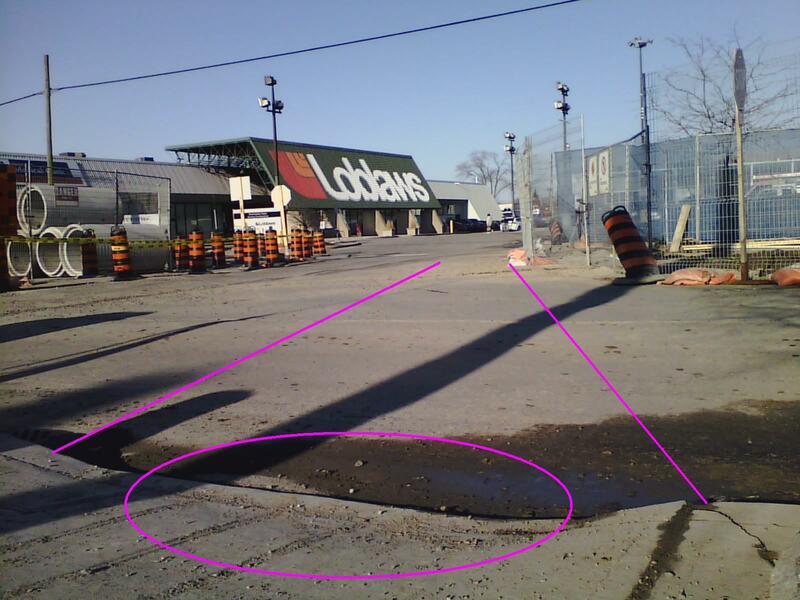 Regarding Image 5 and why the curb ramp has been left open – this was discussed during the site walk. One of the community liaisons said that it had been blocked off at one point, but it was noticed that someone in a mobility device leaving from the opposite side of the street (i.e., from Loblaws or Burger King) had crossed in the middle of the roadway, and then had no way to get onto the sidewalk on the west side of Leslie Street. So, although leaving the ramp open does invite people to cross at this point, it was deemed the lesser of two evils.